Processed foods have become a significant part of the modern western diet. They are often convenient, cheap and very palatable. But they come with a consequence – a negative effect on our health if consumed too frequently. 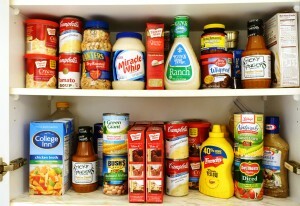 Processed foods are broken into categories. 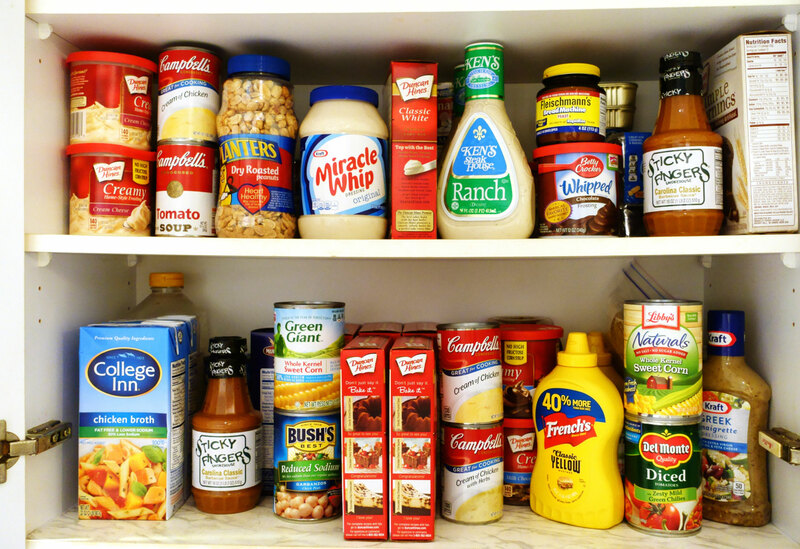 Group 1 – minimally processed foods. These still resemble the natural food source. Current nutritional research shows no negative affects associated with eating from group 1 and choosing moderately from group 2. The problem lies within group 3. What are the consequences of eating too many group 3 processed foods? Processed foods are calorie-dense, sugar laden and then smothered with salt. In fact, research has found that as consumption of processed foods increases so does the amount of sugar, saturated fat, total fat and calories consumed in the individuals overall diet (1, 2). 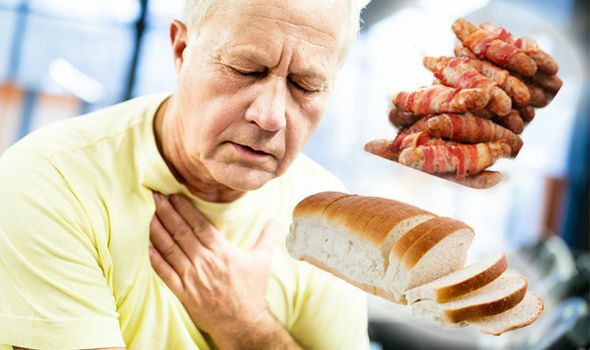 There is also an inverse relationship between the ingestion of processed foods and the amount of protein, fibre, vitamin A, B6, B12, C, D, niacin, riboflavin, thiamine, zinc, iron, magnesium, phosperous and potassium contained within the diet (1). 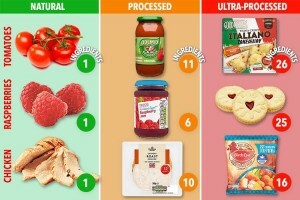 Ultra-processed foods are often more calorie dense that naturally occurring food products. This means they have more calories for a lower volume of food. This can lead to weight gain by our increasing calorie intake without providing filling volume in our stomachs. Thus we don’t get the mechanical stretch signal from our stomachs telling us we are full and to stop eating. Additionally, due to added sugar and processing that removes fibre, such foods are often high GI. This means they will cause a spike in blood glucose levels followed by a rapid decrease, leaving you feeling hungry again in a short time. Moreover, these salty and sweet foods are highly addictive and moreish, so you end up eating more than you need to. Research also suggests that the high content of fructose in processed foods can also lead to obesity, as fructose doesn’t trigger satiating hormones as glucose does (3). As stated above the high-GI of ultra-processed foods often causes rapid elevations in blood sugar concentration and is an independent risk factor for diabetes (4, 5). Additionally, high saturated fat intake, which is seen in the diets of people who consume processed foods, further contributes to insulin resistance and thus diabetes (3). Processed foods can also be indirectly linked to diabetes, as obesity is linked to insulin resistance, through a complex relationship. (3, 4). Metabolic syndrome is a chronic condition characterized by low HDL (“good”) cholesterol levels, high blood pressure, elevated blood glucose concentration and increased waist circumference. Diagnosis of metabolic syndrome significantly increases an individual’s chance of cardiovascular diseases and stroke later in life (6). A study has shown that even when controlling for other variables there was a strong relationship between diagnosis of metabolic syndrome in adolescents and processed food intake (6). There is some controversy regarding artificial additives placed into processed foods and their impact on our health. While these are generally deemed safe for our consumption, why not avoid them anyway? They aren’t a necessary part of our diet. Next time you are at the supermarket check your trolley. Is your trolley mostly occupied by fresh fruits, vegetables, and lean animal product? If it is filled with packaged, bagged and boxed food (even if they claim to be “healthy”) you are probably purchasing too much processed foods. Try to shop mostly around the out skirts of the supermarket and less in the middle isle where all the processed foods reside. Your health will thank you for it! 1. Moubarac JC, Batal M, Louzada ML, Steele EM, Monteiro CA. 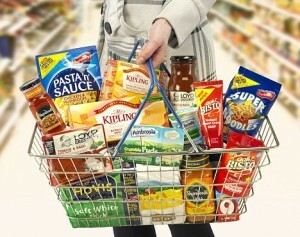 Consumption of ultra-processed foods predicts diet quality in Canada. Appetite. 2017 Jan 1;108:512-20. 2. Bielemann RM, Motta JV, Minten GC, Horta BL, Gigante DP. Consumption of ultra-processed foods and their impact on the diet of young adults. Revista de saude publica. 2015 May 26;49:28. 3. Isganaitis E, Lustig RH. Fast food, central nervous system insulin resistance, and obesity. Arteriosclerosis, thrombosis, and vascular biology. 2005 Dec 1;25(12):2451-62. 4. Ludwig DS, Hu FB, Tappy L, Brand-Miller J. Dietary carbohydrates: role of quality and quantity in chronic disease. BMJ. 2018 Jun 13;361:k2340. 7. Rauber F, Campagnolo PD, Hoffman DJ, Vitolo MR. Consumption of ultra-processed food products and its effects on children’s lipid profiles: a longitudinal study. Nutrition, Metabolism and Cardiovascular Diseases. 2015 Jan 1;25(1):116-22. 9. Yang Q, Zhang Z, Gregg EW, Flanders WD, Merritt R, Hu FB. Added sugar intake and cardiovascular diseases mortality among US adults. JAMA internal medicine. 2014 Apr 1;174(4):516-24. 10. Morrison AC, Ness RB. Sodium intake and cardiovascular disease. Annual review of public health. 2011 Apr 21;32:71-90.